The species within Buxbaumiidae are typically found in Northern temperate to subtropical climates of the world, and are restricted to acidic or neutral substrates. Substrates include rotten wood, rock, and soil. Species are uncommonly found in the tropics and southern hemisphere. There is a lot of morphological diversity within Buxbaumiidae. An evident pattern is seen between the size of the gametophytic and sporophytic generations. 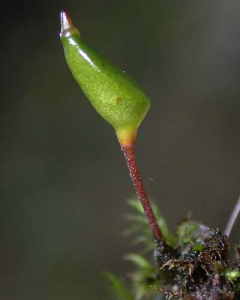 Typically, the sporophytic generation can be seen macroscopically while the gametophytic generation is the smallest in comparison to other bryophytes. The leaves of the gametophyte are acostate and spirally arranged around the short stem. The reduced male and female shoots are borne from the same protonemal shoots. One antheridium is surrounded by a single unicellular flap of tissue. Female shoots are composed of 1-5 archegonia that are surrounded by 6-10 non-chlorophyllose leaves. The uniseriate and branched protonemal phase gives rise to these shoots. The sporophytic generation is unique to Buxbaumiidae. The sporangium typically has an oblique-horizontal and asymmetric surface, with a cucullate or mitrate calyptra. The neck and seta are short, and there is an endostome and exostome. Typically, the articulated endostome is arranged into a pleated cone-shape, while the exostome is irregular, rudimentary, or absent. The peristome aids in identifying species. For instance, in Buxbaumia the endostome is colorless, truncate, and cone-shaped with 32 pleats. The exostome is composed of alternating grooves and pleats and can form up to 4 rows of concentric teeth. The uniqueness of Buxbaumiidae is truly a spectacular sight to see!